All times are ET/PT unless otherwise noted. All programs are rated TV-PG unless otherwise noted. In commemoration of the 15th anniversary of the start of the Gulf War, Military Channel presents IRAQ VS. IRAQ – a side-by-side comparison of Operation Desert Storm in 1991 and Operation Iraqi Freedom in 2003. The program illustrates that although the setting was the same, these are two radically different wars. Iraqi Freedom was a war fought with a much smaller force than Desert Storm, yet it made up for fewer troops with much smarter weapons and advanced technology. The troops in 2003 faced a new enemy and the uneasy task of rebuilding a nation in the midst of an ongoing insurgency. Operation Desert Storm and Operation Iraqi Freedom were two wars, years and worlds apart – yet they show how the United States is transforming the way it goes to war. In 2005 the U.S. Navy launched an advanced warship called the X-Craft. The 262-foot aluminum catamaran, powered by a suite of diesel, gas turbine and water jet engines, is capable of an unheard-of 50-plus knots of speed and represents the first of a new class of state-of-art ships that begins a transformation of our modern Navy. 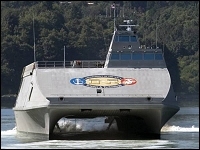 Viewers will get an exclusive look into the creation of the U.S. Navy’s newest, fastest, most radical warship, the X-Craft, as well as first-ever access to the Naval Surface Warfare Center where the X-Craft was modeled and tested. Didn’t find what you’re looking for on this page? See our Site Map or search Google below.